Essentially, what we need to do here is to connect a service running in Neo (Web IDE Full-stack) with a service running in Cloud Foundry (your FaaS instance). A Cloud Foundry subaccount that has been created with the “Enable beta features” flag switched on. If this is not the case, a new subaccount must be created because the “Enable beta features” flag cannot be set retrospectively. As per Liat Borenshtein‘s comment below, this scenario cannot yet be implemented using a SAP CP Trial account. From the side menu on the left, select “Instances”, then check that a Functions instance exists. If no (suitable) service key exists, create a new one. So Why Do I Need a Service Key? The service key contains specific information about the service instance you have just created. , "verificationkey": "-----BEGIN PUBLIC KEY----- <snip> -----END PUBLIC KEY-----"
Here is where we will find the important values needed to connect Web IDE (running in Neo) to your instance of the Functions Dashboard you have just created here in Cloud Foundry. The URL of the service instance you have just created. This is known as the protected resource. In our specific case, this is the URL for the Functions Dashboard running in the EU10 data centre. In order to access this protected resource, the user must know this URL together with the values of the following three fields. uaa.clientid The unique ID of the service broker for this particular service instance. uaa.url The URL of the Cloud Foundry authentication server that will generate the required OAuth token. Notice that the uaa.url field contains the URL of the authentication server within your own Cloud Foundry sub account. Using the Neo destination we are about to create, Web IDE will make a request to this authentication server to generate an OAuth token that will then allow it to publish your coding to the Functions Dashboard. Create a new destination. We now need to enter some of the Service Key values created above. Type What sort of connection are we going to use to communicate with the protected resource? URL The URL of our protected resource. Proxy Type Where is our protected resource located? On an on-premise server (accessed via the SAP Cloud Connector) or on a server accessible via the public internet? Here we’re going to use OAuth2ClientCredentials. Client ID The unique Id of the service broker managing our service instance. The URL of the server that will generate the required OAuth token. This value is found in the Service Key field uaa.url and needs /oauth/token appended to it. The Token Service User and Password fields are left blank because in this case, the Token Service server itself does not require a user id and password before it will generate an OAuth token; all it needs is a valid clientid and clientsecret. Two additional properties must also be added to the destination.Without the first of these additional properties, this destination will always remain invisible to Web IDE, and without the second, this destination will not be recognised as pointing to a FaaS deployment target. At start up, Web IDE is passed a JSON object called listDestinationscontaining all the Neo destinations for which this flag has been set to true. The value of this field indicates the type of service to which Web IDE has access. Once you have entered these values, press Save. We have now created a FaaS instance in Cloud Foundry with a service key, and then used the information found in the service key to define a destination in Neo. The Neo destination will then be used by Web IDE Full-stack (also running in Neo) to deploy functions to the Functions Dashboard instance running in Cloud Foundry. In order to test the connection between Neo and CF, we will create a simple function and trigger in Web IDE Full-Stack, and then attempt to deploy them to our instance of the Functions Dashboard. Start SAP Web IDE Full-Stack from your Neo account. In Web IDE, click on Preferences (the gear wheel icon on the side menu to the left) and select Features. Ensure that the SAP Cloud Platform Functions (Beta) feature is switched on. If this feature is not switched on, do so, then save your changes and restart Web IDE. 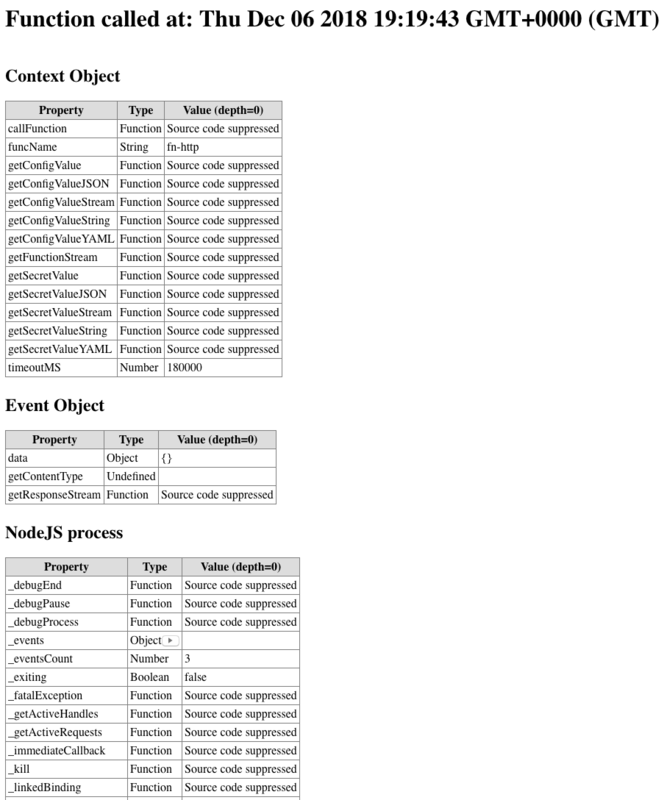 Expand the folders test-fn-project -> functions -> fn-http and edit file index.js.This file is a basic NPM module and for the sake of simplicity, will export only one function. // Or supply the numbers of minutes by which your timezone is offset from UTC. The order in which the parts of our project are deployed is important! After a few seconds, you will see an alert in the top right corner of the Web IDE screen informing you that the function has been deployed. Next, the trigger must be deployed. Right-click on the trigger name http.trg.json and select Deploy -> Deploy Trigger. The same pop-up will be display again in which you can select the destination. Copy the trigger’s URL and paste it into the address line of a new browser tab.You should see a screen similar to the following: In the table display of the server-side objects, any object property of type Object, Array or Map can be expanded in order to view its contents. The point here is really to demonstrate how, by means of a Neo destination, a Neo service such as Web IDE Full-stack can communicate with a service running in a seperate cloud environment; in this case, an instance of the Functions Dashboard running in Cloud Foundry. 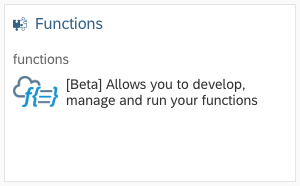 Currently this scenario cannot be run on a Trial account since the SAP Cloud Platform Functions (Beta) feature in SAP Web IDE is not available on Trial.